San Francisco is linked to its historical cable car fleet, and in 1995 – after several successful “trolley festivals” – they added a fleet of vintage streetcars to the mix. 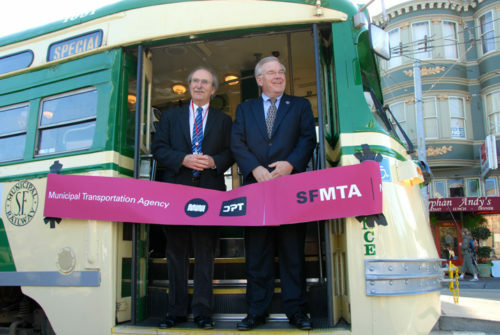 Each of their historical streetcars operated by the Market Street Railway carries a paint scheme for a city that used the streetcar design in question, as well as designs from San Francisco over the years. One of those streetcars is #1051, painted to match the San Francisco fleet as it looked in the 1970s. It was this paint scheme that led to this particular streetcar appearing in the movie Milk. The film, which starred Sean Penn as Harvey Milk, chronicled Milk’s rise as the first openly gay person to be elected to office in California, as well as his tragic death at the hand of former San Francisco supervisor Dan White. This streetcar was re-dedicated in March of 2017 in Harvey Milk’s memory.